Heads of military centers and programs targeting post-traumatic stress disorder and traumatic brain injury in service members and their families reported progress yesterday in the timely recognition and treatment of these and related health conditions. Retired Air Force Tech. Sgt. Chris Ferrell, a former explosive ordnance disposal technician who suffers from post-traumatic stress disorder and traumatic brain injury after combat tours in Afghanistan and Iraq, displays a mask he painted in Hanover, Pa., April 5, 2017. The mask, which bears the initials and dates of death of his teammates, Air Force Tech. Sgts. Tony Campbell and Adam Ginett, is a form of art therapy employed by therapists to help PTSD patients verbalize past traumatic events. It is one of the therapies that will be used at the Air Force's Invisible Wounds clinic scheduled to open at Eglin Air Force Base, Fla., in 2018. Air Force photo by J.M. Eddins Jr. Joining them on the panel were Army Lt. Col. (Dr.) Chris Ivany, chief of behavioral health in the Army Office of the Surgeon General, and Navy Capt. (Dr.) Thomas Johnson, site director for the Navy Intrepid Spirit Concussion Recovery Center at Camp Lejeune, N.C.
"One of our largest tasks is better understanding why PTSD and TBI often present with depression, chronic pain, substance-use disorders and suicide risk," he said, noting that longitudinal research efforts such as a 15-year study on TBI aid understanding and provide a framework for creating effective rehabilitation and support programs. "We’ve evaluated over 150 mental health, TBI, substance-use and suicide-prevention programs over the past five years, [and] this program evaluation has been invaluable," Colston said. Magnetoencephalography laboratory scientist Mihai Popescu points out areas of magnetic activity in a brain on a display at the National Intrepid Center of Excellence at Walter Reed National Military Medical Center in Bethesda, Md., March 16, 2017. Air Force photo by J.M. Eddins Jr.
"Publication of this five-year study will be completed later this fiscal year and will help us … [ensure] our funding is tied to programs that work, such as the U.S. Army’s embedded behavioral health program and its associated health data portal," he added. In 2015, there were more 52,000 overdose deaths in America. Opiate overdose deaths went up to 10.4 per 100,000 in 2015. The DoD rate was 2.7 for 100,000, about one-fourth of that. This was accomplished because leaders were focused on service members’ well-being and a focused outcome-based effort on prevention -- primary prevention, selective prevention and indicative prevention, drug testing, provider training, pharmacy protections and medication therapies, Colston told the panel. "We hope to generalize some of the successes we've seen in PTSD and TBI incidents and opioid-overdose deaths in other areas such as suicide prevention and alcohol-use disorders," he said. "Even so,” he said, "we're excited about the successful translation of research into clinical practice including requiring evidence-based therapies for PTSD, event-driven protocols for recognizing TBI, and the use of progressive return activity in the management of concussion." 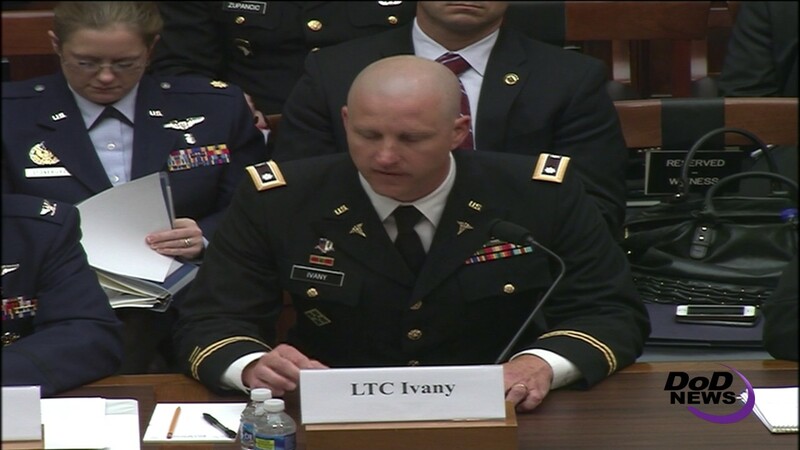 In his remarks to the panel, Ivany said health care is essential to readiness, which is the Army’s first priority. 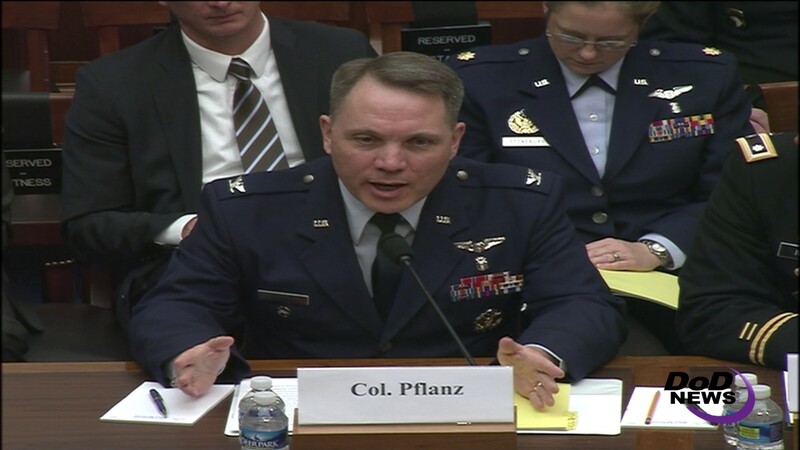 No area has faced as many challenges, made as many changes and achieved as many advances as Army behavioral health care, he told the House members. A traumatic brain injury patient walks through a virtual reality scenario at the Computer Assisted Rehabilitation Environment Laboratory at National Intrepid Center of Excellence at Walter Reed National Military Medical Center in Bethesda, Md., March 20, 2017. The patient is attached to a safety harness and walks on a treadmill on a platform that moves and rotates in conjunction with movements of the projected environment. Motion capture cameras track the patient’s movements via reflective markers that are applied to the patient and supply data on physical deficits to physical therapists. Air Force photo by J.M. Eddins Jr.
Senior Army medical leaders also made a pivotal decision to centralize the oversight and direction of all clinical programs and built a small team of professionals in the surgeon general’s office to do so, he said. The team analyzed the effectiveness of clinical programs, identified best practices and replicated them across the force. From this process came embedded behavioral health, which has reduced barriers to care for soldiers in combat units, and improved access and readiness. In his remarks, the director of the Navy’s Intrepid Spirit Concussion Recovery Center said that about 80 percent of all TBIs are classified as mild. Those who have suffered mild TBIs may experience only subtle changes in mood, memory, sleep and balance. They have no visible signs of injury, Johnson said, but often struggle to function at work, at home and in the community. "The reality is there is currently no diagnostic tool that is sensitive and specific for mild TBI," he said. "However, we have worked to overcome this developing a holistic, integrated, interdisciplinary treatment model that employs a standard evaluation that includes physical, psychological and spiritual dimensions." The Military Health System, in partnership with civilian academic institutions, has a robust research portfolio to address gaps in knowledge and improve care for service members with TBI, he said, including a progressive return-to-activity protocol that gives providers guidelines about how to increase activity in a way that maximizes recovery. DoD has an ongoing longitudinal study of TBI in members of the armed forces to better understand the condition and make sure patients get the treatment they need, Johnson said.